Cotton canvas, cotton batting, cotton thread. Machine quilted and hand quilted. This quilt, titled “Snake Shoals on the Chattahoochee,” depicts a nine-square-mile spot on the Chattahoochee River, approximately 20 miles south of Columbus, Georgia, and Phenix City, Alabama. Using U.S. Geological Survey maps as references, as I have with a number of other quilts I’ve made, I tried to render the map as accurately as possible. “Accurate to the width of my needle,” I like to say. This quilt was commissioned by the Chattahoochee River Conservancy and will be raffled in the late summer of 2018, profits going to support the health of the river, via the Chattahoochee River Conservancy. When Henry Jackson of the Chattahoochee River Conservancy first approached me about making a quilt for the cause, my reaction was nothing but positive. I love the Chattahoochee and very much appreciate its importance to our region – historically, economically, recreationally …. Henry did a good thing when he gave me plenty of time and complete freedom to make whatever I wanted to make so long as it had to do with the river. My first thought was to work with the flora and fauna of the river, maybe with a focus on the shoal lily. But I made a couple of drafts of shoal lilies and wasn’t thrilled with the results. I also thought of focusing on the mythology of the river – the stories of tie-snakes, of giant catfish underneath the dams, of lovers’ leaps … But eventually I decided that I might save that idea for another time. I was already in “map mode,” and it was to maps that I found myself gravitating. 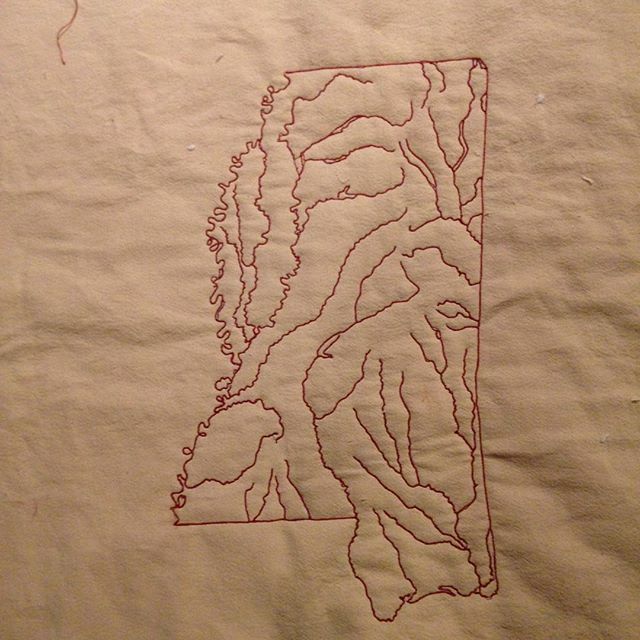 Coincidentally, as I was mulling this new commission, a Facebook friend began posting photographs and stories about her canoe trip through “Snake Shoals.” Rachel Dobson, whose family is from Columbus but who herself lives in Tuscaloosa now, was doing genealogical research when she learned about her great, great, great, great grandfather James Boykin, who in the mid 1830s owned a plantation on the Chattahoochee at a place referenced on old maps as Snake Shoals. Rachel’s photographs fascinated me. At about the same time, I had begun to look closely at the course of the Chattahoochee. (I am interested in the courses of rivers and have for the past few years focused heavily on rendering those courses in thread.) Well, the Chattahoochee does not follow a course quite as dramatic as, say, the Alabama River with its deep and continuous curves, or the Mississippi with its countless oxbows. The Chattahoochee begins in North Central Georgia, takes a southwesterly angle for a while, and then pretty much heads for the Gulf of Mexico (joining, of course, with the Flint at the Florida Line to become the Apalachicola). Now, that description is a “zoom out” view. When you zoom in a little closer, though, you’ll see the most dramatic double curve in the entire course of the Chattahoochee -- at Snake Shoals. I began to look much closer at Snake Shoals and realized the special historical significance of the area. Until The Removal in 1836, the region had been occupied by Native Americans – Muscogee Creek, Hitchitee, Yuchi. In the 1600s this region had comprised the northernmost reaches of Spanish Florida, and in 1689 the Spanish had built a fort here on the river. Then there was James Boykin’s plantation. At some point there had been a ferry across the river somewhere along this stretch. In 1928 the Holy Trinity Catholic Mission was founded within this region. You can read more about the historical significance of the region on Rachel's blog. So Snake Shoals it was. My decision was made, and I set to work. 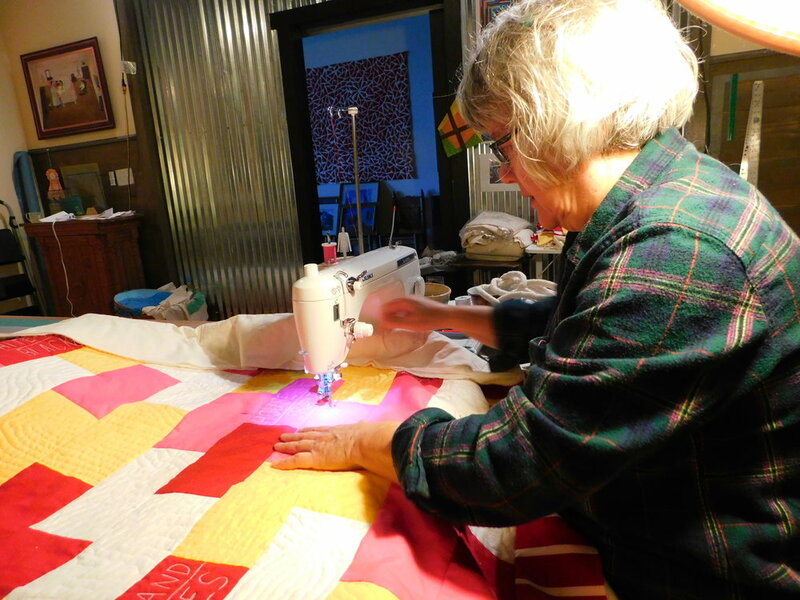 The quilt is made of cotton canvas and features both machine quilting and hand quilting. The contour lines are true contour lines, derived from U.S. Geological Survey maps. The red lines indicate 50-foot differences in elevation; the smaller dark brown lines indicate 10-foot differences. The blue threads indicate creeks and marshes. While this region is primarily rural, a few roads do traverse it. I opted to omit the roads and focus on the natural landscape. The only “human element” I have included is the hand-quilted suggestions of plowed furrows in the big flat regions. I’d like to thank Henry Jackson and Sanna Moravek, Executive Director and Programs Director of the Chattahoochee River Conservancy, for the opportunity to make and present this quilt. Thanks also to Rachel Dobson for the inspiration, the information, and new friendship. And thanks to Fred Fussell for encouragement and for historical information. A little more than five months ago, I left behind my well-tricked-out quilting studio in Columbus, Georgia, and traveled to Oxford, England, where I would for six months serve as site director for a student residence. In terms of sewing equipment, I brought with me only my thimble, a seam ripper, a generic walking foot, a darning foot, and a small stack of cotton fabric that I’d hand-dyed. Within a couple of days of my arrival I went to the nearest big-box craft store and purchased a bottom-of-the-line Singer sewing machine, some pins, and a few spools of thread. I’d already found a decent pair of scissors here in this British house. You can read a more thorough explanation, and see some images, in an earlier post. I had hoped that this minimalist experience – this return to basics – would be good for me creatively. And I think it has. More about that later. What I did not anticipate, though, was how this experience has helped me to focus on what is important, and what less important, in my studio back home. Design wall – I rigged up a make-do one, but it was far from ideal. I did not have the space here for a good design wall. And that gave me pause. Big pause. Rotary cutter and mat – Okay, I admit it. I went out and purchased these two babies. Couldn’t live without ‘em. A long straight-edge. I had a two-foot ruler here, but no straight-edge that was longer. And I needed one BAD! Tables with cut-out for setting in the machine – Big issue for me. I just cannot do my best work – piecing, walking foot quilting, free-motion quilting, any machine work– with the needle plate surface of the machine several inches above the surface of the table. I just cannot. Maybe others can, but I cannot. In fact, I felt so crippled by this issue that I refrained from quilting one of the larger tops I pieced while I was here. I want to free-motion quilt it, and I know that I cannot do justice to the top with this less-than-ideal set-up. Simple six-foot rectangular folding tables with matte-finish tops. Oh, my lord I did not know I loved my regular ol’ folding tables so much! Here at Spencer House I worked (or tried to work) on the two formal dining tables. Neither is rectangular, and their tops are slick as owlshinola. I had to constantly fight with my fabric to keep it from sliding off the table. Finally I resorted to working on top of tablecloths, an act which, obviously required diligence less I cut into the cloths. Do you notice what is NOT on my “missed most” list? Answer: My expensive sewing machine. Now, I did miss it – sort of. And were I at home I’d be limited, I guess, by the fact that the el-cheapo machine I purchased and used here will not sew on canvas. But I managed just fine with this little hundred-dollar Singer. Just wish I had had a table with a cut-out for setting her down into. So, I find it interesting that the most expensive item, by far, in my home studio is the item I missed least. And some of the far less expensive items in my home studio were the ones I missed most. Hmmm. I’d been thinking of investing in a second expensive machine. Maybe now I’ll give that notion some more thought. Okay – Below are some photos of the pieces I’ve made since I’ve been over here. But first! I almost forgot! Big shout-outs to Village Fabrics in Wallingford, UK, where I traveled by bus several times to buy batting (They call it wadding.) and thread. The folks in Village Fabrics were not only friendly and helpful, but they hooked me up with a new kind of batting that I really love – Hobbs 80/20. I’d used Hobbs wool before, but I didn’t even realize Hobbs made this very nice 80/20. I wound up using both the fusible and the non-fusible and found both of them mighty fine for both machine as well as hand quilting. Okay – For real now the photos of my quilts, minus bindings (except for the first one) which I choose to do after I get home (mainly ‘cause I used up all the big pieces of my hand-dyed fabrics and am going to have to dig into my home stash to find appropriate fabrics for bindings). And, obviously, I haven't started quilting the last two. Once again Columbus State University, the institution from which I retired almost six years ago now, has afforded me the opportunity to spend time in Oxford, England. I’ll be here for six months, serving as Site Director for Spencer House, CSU’s student residence in Oxford. I’ve been here in that capacity twice before, but for three months each of those other times. This will be my first six-monther in England, and I’m thrilled to be here. So is my husband, Fred Fussell, who's here with me. One of the biggest challenges with leaving home for an extended period of time, obviously, is leaving my studio. I love my home studio, which is tricked out with supplies and equipment and tools that I’ve spent more than 50 years accumulating. It is not without some trepidation that I leave that fine space behind for six months. Oh, I did hand-quilt a whole, big quilt the last time I was here. And I’m proud of that – but I missed piecing – the construction, from scratch, of quilt tops – a process I’ve come to love. You’ll note that my thimble, lined with moleskin which you cannot see, is front and center. So is my seam ripper – not that I couldn’t get one of those over here – but it fit into the container nicely. I also included a generic walking foot and a generic darning foot, which you probably can’t discern in the photo. I did not even bring a pair of scissors. No rotary cutter, no self-healing cutting mat. It was hard to leave those babies behind, I’m tellin’ ya! I did find this pair of scissors in a drawer here in Spencer House, though – and they work just fine! My next step was a sewing machine. I gave some consideration to dragging one of mine over here, but I despise having to keep up with tons of luggage, and I thought it made more sense to buy an inexpensive machine after I got here. So that’s what I did. On our second day here Fred and I found our way to a Hobbycraft store (their version, sorta, of Hobby Lobby) and bought a bottom-of-the-line beginner Singer for 79 British pounds. That’s about a hundred bucks. I’ve had very good luck with these el-cheapo Singers back home, having used one as my exclusive machine for many years, only two years ago amping up my game with a more expensive Juki. I still use my 15-year-old hundred-dollar Singer from time to time. Anyway, I bought the little Singer, walked and bussed it back here to Spencer House, set up, and got going. Oh, you’ll note the fabrics on the table. I did bring a stash of hand-dyed fabrics from home – in my carry-on. Oh, one more thing I want to say about my studio here in England – This ill-fitting moo-cow ironing board cover and I are scheduled for a parting of the ways! Here's a photo of my studio, all spiffed up and serving as my gallery, at last month's Swift Mill Lofts Open Studio and Art Sale. Well, this is one wall of my studio. This is about half of the quilts that I offered. Sales were good, I am happy to say! Many thanks to everybody who visited, and very special thanks to those who purchased. I hope you enjoy your quilt! 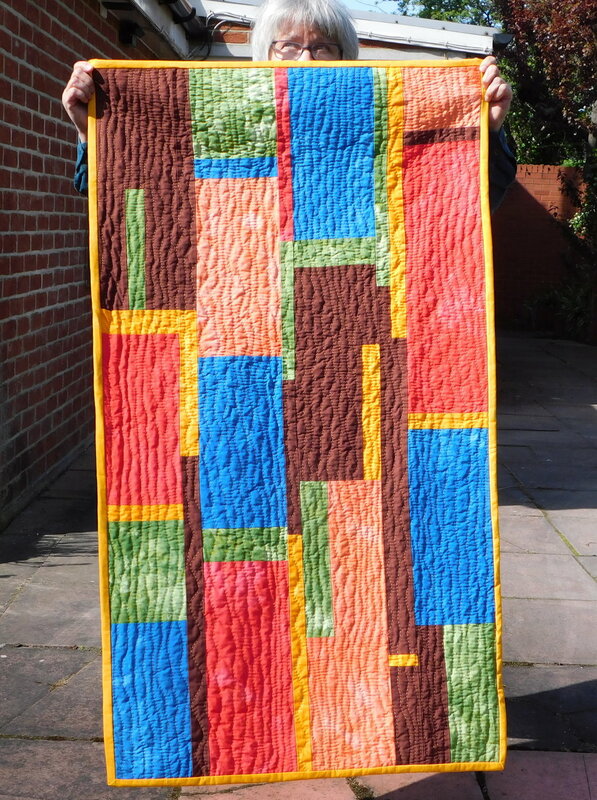 Last month’s sale was the first time I’ve ever really truly offered quilts for sale, but it won’t be the last. In fact, I’ve added a sales component here on my blog. Check out the “SHOP” tab at the top of this page. 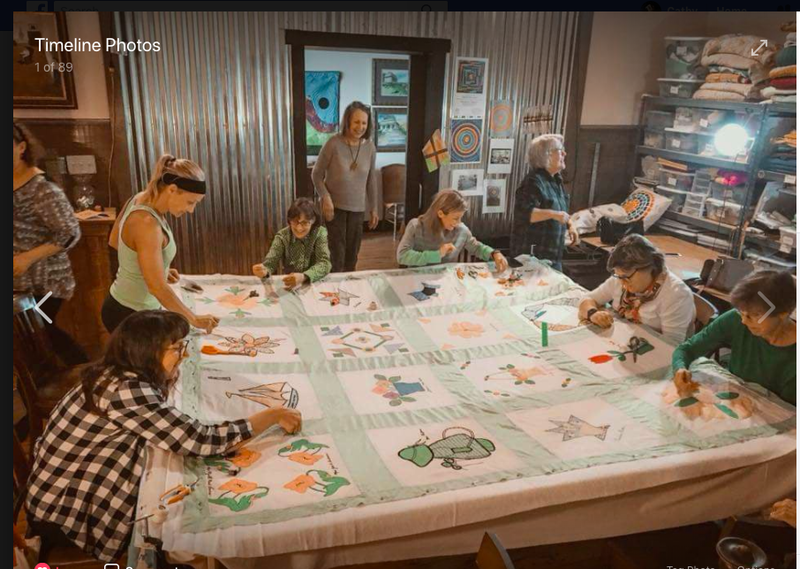 · I taught two workshops – one here in my own studio and one at daughter Coulter’s YaloRun Studio out in Mississippi. I also gave two lectures – one here and one there. 1. “William Faulkner’s AS I LAY DYING Graphic Novel Version” into Studio Art Quilt Association’s SOUTHERN ACCENTS exhibit at Ruth Fun Center for Textile Arts in Melbourne, Florida. 2. “Abby’s Quilt” and “Livi’s Quilt” into Bulloch Hall Quilt Show, Roswell, Georgia. 3. “Hillsides of North Alabama” into Quiltcon 2015 in Portland, Oregon, where it won second place in hand-quilting. 4. “Satsuma” has been accepted into Quilting 2016 in Pasadena, California, where it will be exhibited in February. · I joined Studio Art Quilt Association and attended my first SAQA conference – in Melbourne, Florida. It won’t be the last. Many thanks to my quilting friend JoAnn Camp for encouraging me to join SAQA! · My quilting and I were the cover story for the December issue of ART CURRENTS magazine. · I continued to work on my studio and now have it near-perfect. 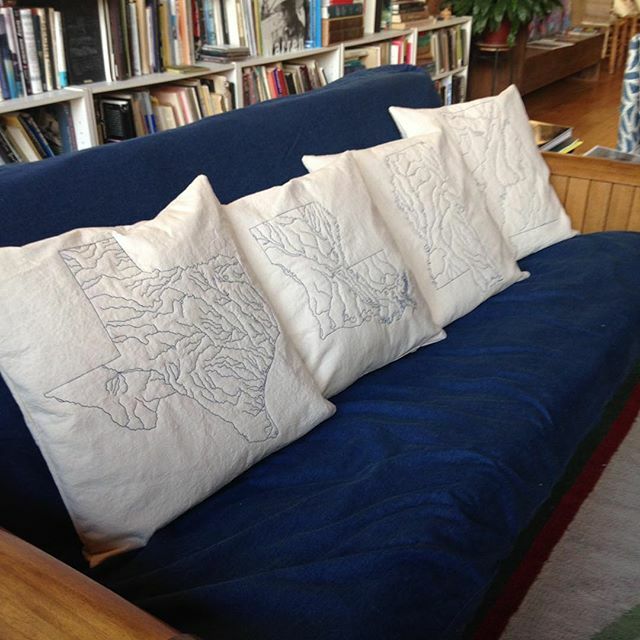 · I ordered floor frames for hand-quilting and look forward to their arrival within the next few days. · I created this website. 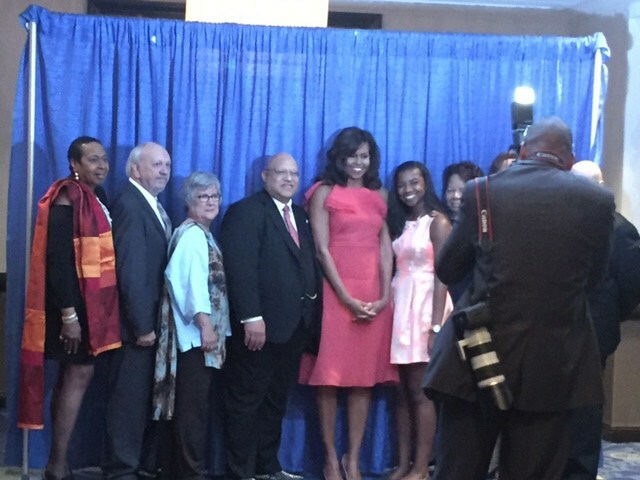 · To continue to hone my skills and to explore new means of artistic expression in fiber. · To maintain this website. · To work toward settling the lighting issues in my studio. 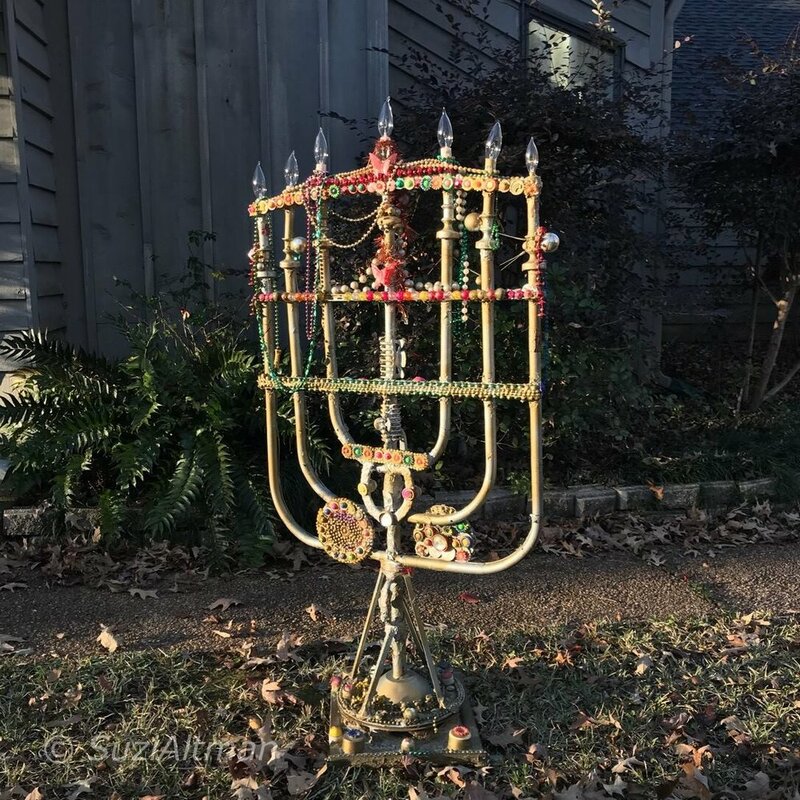 · To teach a few more classes and reach a conclusion regarding balance of time between teaching and quilting. · To continue to keep my detailed quilt journal. · To travel to at least one major art quilt exhibit. · And, of course, I have a number of quilt-specific goals already – for instance, “to make a xxxxx quilt,” “to make a yyyyy quilt,” “to make a zzzzz quilt” … but I won’t get into all those details here. You’d better believe they’re in my journal, though!